My triplets, (I never call them that by the way… it’s usually ‘the little guys’, or I simply call them by name) where born at 35 weeks, 6 days. When you are carrying multiples, every day counts and can really have an effect on their health now and in the future, so the longer you keep them in, the better! This is also VERY important for any pregnant mom, so don’t be in such a hurry to welcome that little baby into this world because of a little discomfort you may be feeling, it really can affect the baby in ways that your OB/GYN may not share with you because they just can’t stand listening to your complaints, or maybe your Dr. is more concerned about their schedule and wants to have all the pregnant ladies scheduled so it won’t mess up their weekend, either way, make sure you are doing the research and know exactly what the risks are for having that baby before the recommended 40 weeks. And let things happen naturally, if possible. I say if possible because some people will always need help with labor. Some women may not go into labor in a healthy time frame for the baby, just make sure you understand your options and risks before you decide that you just can’t make it past 36 weeks because you can’t sleep, and your back hurts! My OB/GYN for my first baby, littleBee1, was in a big hurry to keep things on schedule. I went to her office on my due date and she was scheduling a hospital bed for me because I’d obviously need to have this baby today, “IT WAS MY DUE DATE!” I was very nervous, first-time mom, and I almost went with it, but my gut told me that my little baby girl just wasn’t ready, and I was willing to wait it out, as long as she was healthy and safe. The OB/GYN actually got irritated with me, rolled her eyes and walked out. She made me over think my decision and worry that I had made the wrong one. One week later, I was scheduled to be induced. Everything went well but I still wish that I could have waited and went into labor naturally. With triplets, I really didn’t have much of a choice when it came to the date of their birth. I did what my team of doctors told me to do and was able to keep those babies in for 36 weeks. Things are much different when you are carrying more than 2 babies. Doctor visits are more frequent, Ultrasounds are more frequent, and near the end of your pregnancy, you end up at the hospital every other day or so to visit the perinatologist, so they can make sure those babies are doing good. My ‘scheduled’ due date, which I was informed for the safety of the babies, and me, needed to be a c-section, was Friday the 13th. I’m not a superstitious person. I own a black cat, have no problem opening an umbrella indoors, haven’t found a reason to walk under a ladder, but would if I needed too, but the date did sit in the back of my mind and make me a bit uncomfortable, however, I figured it would be a fun story to tell the little guys when they grow up. My last appointment at the Perinatologist was Thursday the 12th. I didn’t sleep at all, had panic attacks all night – and thought I was going to die because my throat hurt and was swollen to the point that I couldn’t breath. I sat on the couch all night, crying, and trying to reduce the swelling in my throat with popsicles so I could make it through the night! I’m fairly confident now that my throat was not swollen, and I was not on the verge of death, but that night it felt very real. I got up, ate breakfast and took a shower that triggered major itching spasms. I had little red bumps on my legs, and they itched so bad I thought I was going to rip them off, and the other problem was that every time I scratched, they just itched more. I don’t know what it was, but it had occurred before during this pregnancy, just not to this extreme. I was extremely tired, very itchy, crying and now it was time to head to the hospital for my appointment – FABULOUS! Once we arrived, I was hooked up to 3 baby monitors, which was always a fairly long process, and I sat and waited for the doctors report on the babies condition. The nurses always set up the monitors, and report back to the Perinatologist. Today the Perinatologist came in to talk to me and I knew that my very tired body and mind was about to be tested. littleBee2, aka, baby C, was not responding as the doctor would have liked, so it was time to get those babies out, for her safety. So I was admitted to the hospital, and the staff of 10+ was called in for the birth of my 3 babies: a couple nurses for each baby, 2 doctors, Neonatologist, Anesthesiologist, and of course hubbyBee. Since everyone was scheduled for the next day, people were literally running around making phone calls to get everyone to the hospital as needed. 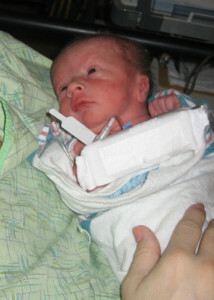 Once everyone was ready, I was wheeled to the very cold delivery room that was located adjacent to the NICU. I had the shivers really bad from the anesthetic, so once bubbyBee was brought into the room, he tried to comfort me, and missed the birth of littleBee2. One after another, the babies were born, probably all within a minute or two at the most. I remember not hearing a lot of crying and I kept asking hubbyBee if everyone was OK. He reassured me that they were, and I tried to remain calm as they were whisked away to the NICU. 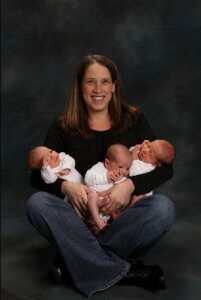 littleBee2 was released from the NICU in 5 days, littleBee3, 7 days and littleBee4 in 10 days, all healthy and happy! 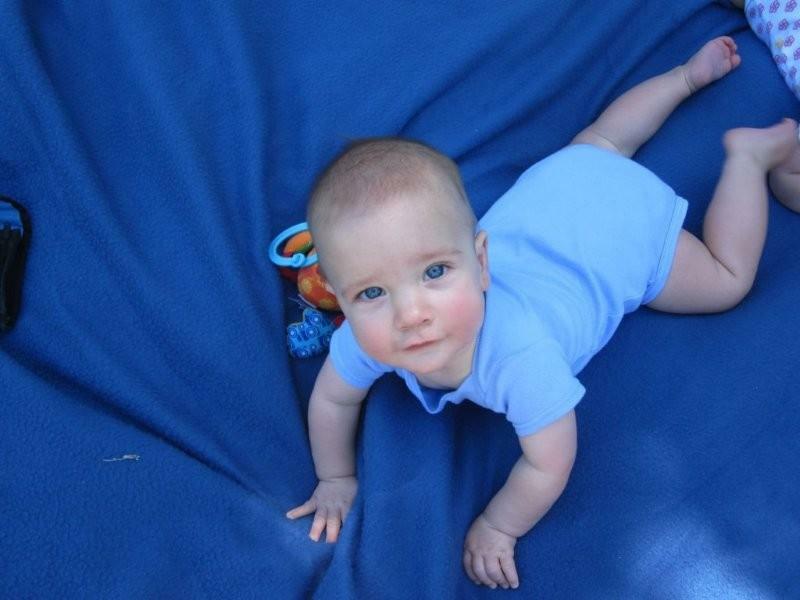 Previous post: Boy vs. Girl… not even remotely an even match in my family!